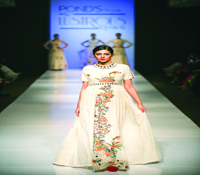 Designer Purvi Doshi is no stranger to success and fame. Having won the Emerging Designer award by Grazia and showcased her collections at numerous editions of Lakme India Fashion Week, she has built herself quite a fan following. She now ventures into the online world, to tap into a market that is ever expanding. a�?People from places like Kenya and Australia, visit me after my shows and express unhappiness about the unavailability of my clothes outside India. This is for them and those who appreciate a well-constructed Indian garment,a�? explains Doshi, about her the launch of her web boutique, purvidoshi.com. Contributing to the revival of ancient Indian crafts, her online store stocks her collections from four fashion weeks, apart from kurtas, tunics, kaalidars, dresses, trousers, skirts, shirts and stoles, all bearing the Purvi Doshi stamp of folk art with a touch of whimsy and quirk. Elegantly simple, her Back to Start collection, uses the natural hue of cotton and khadi peppered with bright pops of colour. a�?Ia��ve used the traditional mirror embroidery craft of Gujarat, largely popular with tribal costumes, and used them in a contemporary and current fashion,a�? explains Doshi. If the Back to Start collection is a study in sobriety, the Chhavi line is a riot of colours, heavily embellished with tasteful mirror-work. The palette shifts from coral to crimson, olive green to aqua and mustard on skirts, dresses, saris and blouses. In the Sanrakshan line, she uses plain white, as a canvas to highlight animals and birds in starkly contrasting shades. Her latest, Renaissance, works with natural dyes to combine the aesthetics of Europe and Gujarat, evident in the typical European long sleeves and floor kissing gowns complemented by open backs, gathers and pleats of the ghaghra cholis. While her garments start at around `3,000 (Pret and festive) and go up to `1 lakh, Doshi is currently working on a line that falls in the price range of `1,000 to `5,000.